NATO does not have any “direct evidence” that Russia has deployed additional nuclear weapons, the block’s top military commander has said. It comes in light of Kiev accusing Moscow of moving some of its nuclear arsenal to Crimea. 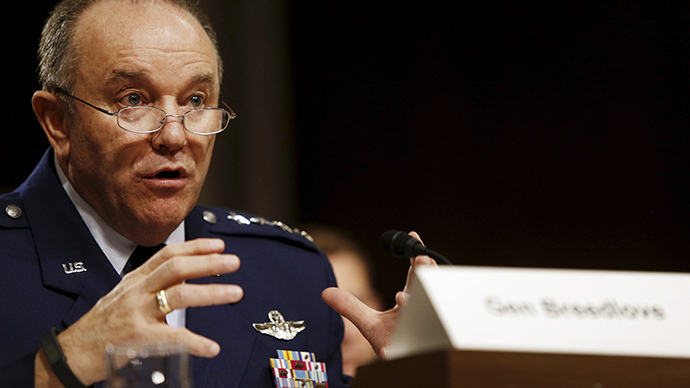 “We have to be very clear – we have not seen direct evidence of any deployment of nuclear weapons [by Russia],” the Supreme Allied Commander Europe (SACEUR) Breedlove told reporters in Brussels. “We do not need to make any adjustments to our nuclear posture. First and foremost, we have a secure, a safe and a very capable nuclear response and that’s our mission – to keep it that way,” NATO’s top military commander said. Breedlove’s statement comes after Ukraine alleged that Russia is expanding its nuclear capability into Crimea. The secretary of the Ukraine’s National Security and Defense Council, Aleksander Turchynov, told Ukrinform that Russia was taking steps toward moving nuclear weapons to the Black Sea peninsula. However, the NATO general did not dismiss the accusations altogether: “We have not seen any direct changes, but that does not mean that they may not have happened. Remember that lots of the systems that the Russians use to deliver nuclear weapons are dual-use systems. They can be either conventional or nuclear and some of those systems are deployed,” the general said. At the same time, Russia’s Navy chief, Admiral Viktor Chirkov, announced plans in early May for upgrading Russian naval forces, including the Black Sea Fleet stationed in Sevastopol, Crimea. The Crimean Republic became part of the Russian Federation last March, after over 96 percent of its residents – the majority of whom are ethnic Russians – voted for the move in an urgently called referendum. The vote was triggered by a sudden regime change in Ukraine, which ousted the democratically elected president and government. The latest poll conducted in March showed that over 90 percent of Crimean residents have positive feelings about the reunification with Russia, the national public opinion research center VTSIOM said.